Despite the global art market growth slowing in 2015, the online art market has continued to go from strength to strength, in 2015 it was up 24% to $3.27 billion*. An exciting outcome of this figure was the fact that the lower end of the art market could be more resilient to a slowdown than the mid- to high-end market. This could be an indication that first-time collectors are going to online platforms as their first port-of-call. 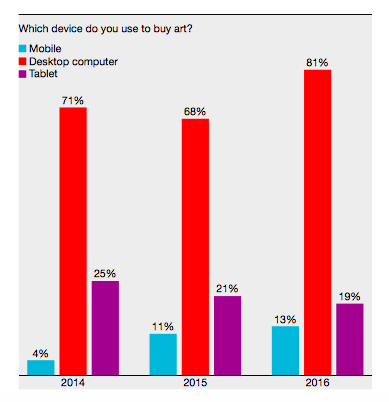 92% of online art buyers expect to buy more or the same amount of art online in the next 12 months. 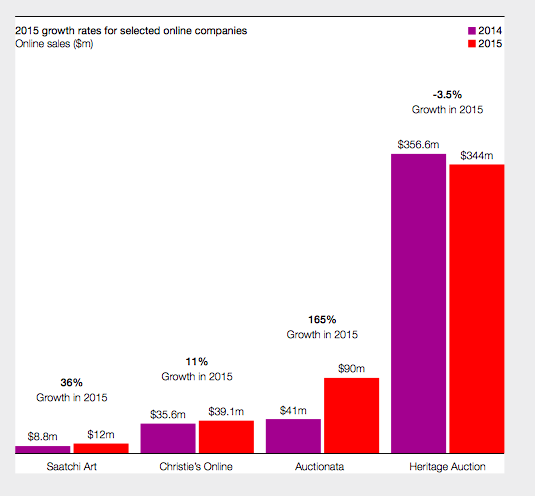 Based on this trajectory by 2020 the online art market could be worth $9.58 billion. The report takes into consideration that sales growth at the lower end of the online art market is going to come from a generation of entirely new art buyers who have yet to be surveyed. 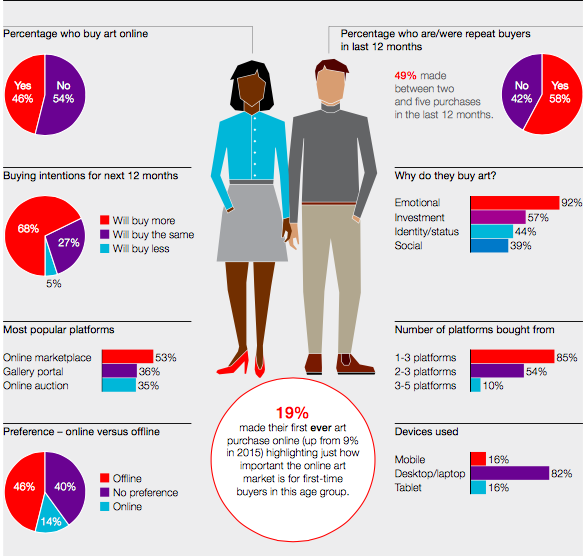 43% of young art buyers said they had bought art directly online, proving that investment in an online presence is vital to capturing the attention of new buyers. Investment in e-commerce has proved fruitful for Sotheby's and Christie's. Both have invested heavily in their digital presence and in catering to new art and collectible buyers who increasingly prefer to buy online. Sotheby’s reported online sales exceeding $100 million in 2015, a first for the annual online total. 32% of online bidders were new buyers, and the number of online buyers increased by 39%. An example of how investment in online paid dividends was Sotheby’s Return of the NIGO sale, a single-owner sale of Star Wars memorabilia, which was 100% sold and exceeded the high estimate with 87% of bidders new to Sotheby’s. In 2015, Christie’s reported total online sales of just under $40 million with online buyers up 10%. Elsewhere on the market, 19% of under 35 year olds said they had bought their first art work online, up from 15% in 2015. Online-only auctions Auctionata and Paddle8 saw online sales more than double in 2015 as they also attracted new buyers. Hot on the heels of this success, in 2015 traditional bricks-and-mortar auctions increasingly came online with the help of aggregators such as Barnebys. A giant step for the global online inventory of art and collectibles, as this gave access to a new global online art buyer community. You can't mention Generation Y without taking into consideration the power of social media. In 2016, 31% agreed that social media influenced their art purchases in comparison to 24% in 2015. The influence remains particularly high on the new art buyer market, where 38% of new collectors said that social media does impact their collecting habits and their decision on when and what to buy. Over the past two years, Facebook and Instagram remain the preferred social media platforms for art buyers. The majority of galleries promote themselves online – mainly through ‘the big three’: Facebook, Twitter and Instagram. With 400 million monthly active users, Instagram has become the fastest growing mobile photo-sharing app in the world. of online art platforms covered in the report have seen significant growth in mobile usage. 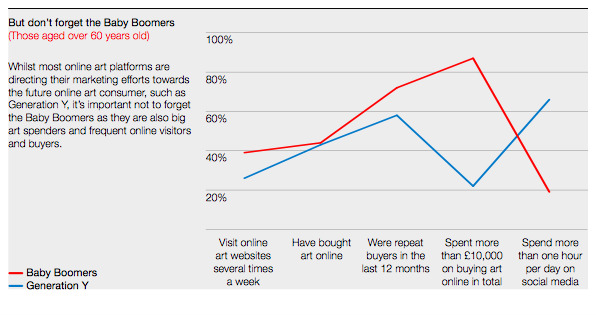 Slowly but surely, galleries are adapting to online buyer behaviour. 28% of the galleries surveyed by Hiscox said they now offered their clients the option to buy and pay directly online, up from 22% in the last gallery survey in 2013. Online sales offer galleries a new channel to the global art market with a growing number of repeat buyers. Among those galleries selling art online, 59% said that they experienced repeat purchases, demonstrating the value and loyalty of online art buyers. 52% of galleries also said that their online sales are mostly going to international clients, suggesting that the online art market is an important channel for galleries to broaden their international as well as domestic client base. 82% of galleries said that the average price of online transactions remained below £10 000, up from 77% in 2013. While positive, this still suggests that the online art market continues to cater for the lower-end of the art market, which again, could indicate online is the most vital factor in attracting new and first-time collectors. 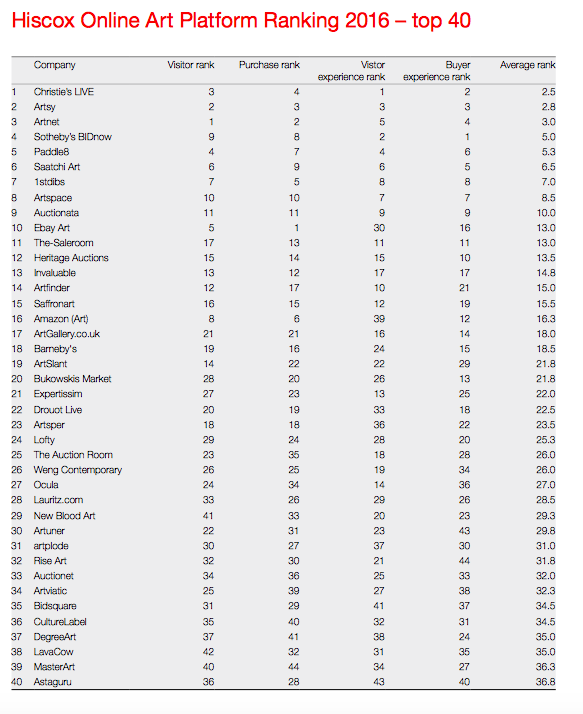 Despite the majority of transactions remaining below £10 000, 42% of galleries indicated an increasing willingness among their clients to spend more money on art works bought online, which could suggest that buyers within this price band are moving up the average price bracket as their confidence increases. 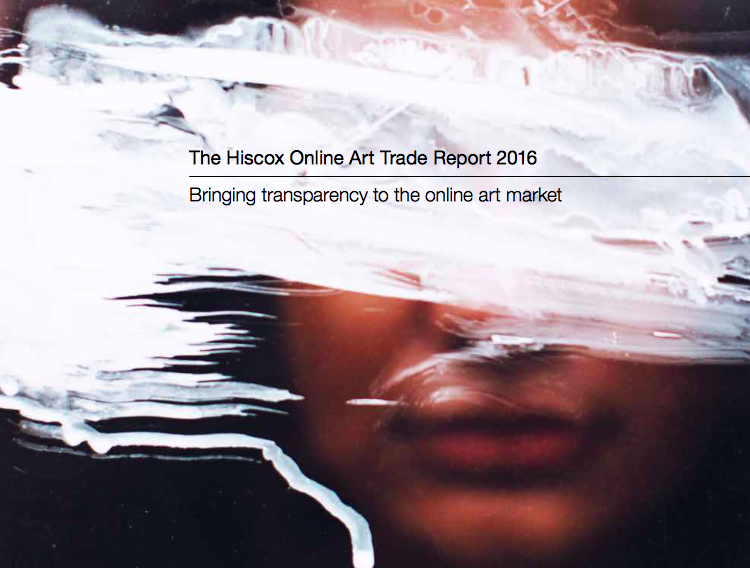 * All figures from in the report are from The Hiscox Online Art Trade Report 2016 which can be read in full here. **Due to the nature of the sample (81% of which are European and American fine art collectors), there is likely to be a bias towards online platforms based in these countries and which focus on fine art. The sample is therefore not necessarily reflective of the popularity of domestic online art platforms in countries such as China, or online platforms covering a wider collectible spectrum, or where fine art is a smaller part of the total inventory.